James Cohan Gallery Shanghai is pleased to present Alex Katz, the first solo exhibition of the artist’s work in mainland China. The exhibition will focus on five recent portrait paintings from 2008 to 2010, along with a selection of prints that feature the artist’s lifelong interest in the landscape. 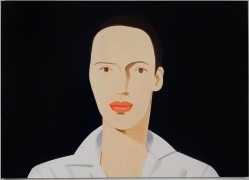 Alex Katz (b. Brooklyn, New York, 1927) has been a defining, preeminent and influential artist for the exhibitions fifty years. Graduating in 1949 from The Cooper Union Art School in Manhattan he was then awarded a scholarship to the Skowhegan School for Painting and Sculpture in Maine, where he studied plein air painting, and which the artist soon realized, as Katz commented, “helped me separate myself from European painting and find my own eyes.” Katz had his first one-person exhibition in New York City in 1954. Since the early 1960s, emerging in New York at the pinnacle of Abstract Expressionism but before the advent of Pop Art, Katz established a singular position for himself and his paintings by working rigorously and independently of these movements, remaining steadfast to figuration and to the landscape. Best known for his portraits of charismatic, stylish women painted with a crisp, methodical precision and bold areas of color, Katz has also painted men, many of whom are fellow artists, dancers, poets and writers from the New York literary world. Groups of people in social gatherings, the landscape and water of Maine, where the artist has spent his summers for many years, in addition to the urban cityscape of Manhattan at night have played a prominent role in Katz’s paintings. 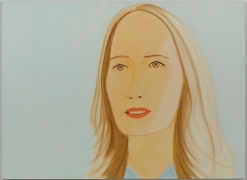 Throughout his career Katz has also portrayed his family, his son Vincent, and the artist’s wife and lifelong muse, Ada, who was the subject of a major exhibition, Alex Katz Paints Ada at The Jewish Museum, New York (2006-2007). In the exhibitions exhibition the painting Ada in Green (2009) and the two aquatint prints Vivien (1994), Vincent Katz’s wife, and Blue Coat (Vincent) from 1993 are on view. Light is a key and central subject in all of Katz’s works. The velocity and subtle, ever- changing shifts of light—‘fast light’ as Katz calls it—and the way it is articulated and captured is an imperative for the artist. Shrewd attention to detail combined with an unfailing economy of means gives credence to the extraordinary technical demands of Katz’s expansive technique, as evident in the five paintings in this exhibition. Each painting embraces its distinctive character and particularities. 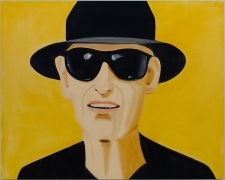 In the self-portrait included in this exhibition, Black Hat (Alex) 2010, a solid blast of yellow defines the background for the smiling artist, at age 84, wearing chic sunglasses and a wide-brimmed black fedora. Also on view are the paintings Tara (2008), Anika (2008), and Ulla (2009), each with their own luminous, penetrating gaze toward the viewer as if entranced by a private moment in a public world. For Katz, appearances are an endless source of mystery that inspires his desire to continually discover something fresh, something not seen before. Printmaking has always been an integral part of Katz’s work. 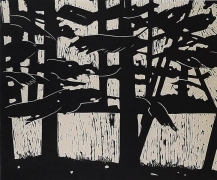 The exhibition includes woodcut and linocut prints such as Forest (2008) and the triptych Twilight I, Twilight II and Twilight III (2009) and the portfolio Landscape (2001). 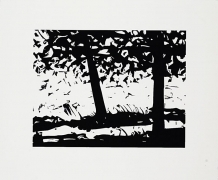 Again, focusing on the artist’s long engagement with light falling between tree branches, capturing an instantaneous moment, these prints are representative masterworks of a subject the artist has explored continuously since the early 1990s. Katz's work has been included numerous group and solo exhibitions internationally since 1951. Several major exhibitions of Katz's landscape and portrait painting in America and Europe followed his 1986 Whitney Museum of American Art retrospective and his 1988 print retrospective at the Brooklyn Museum of Art. 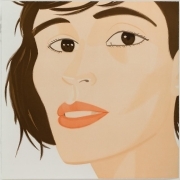 The Paul J. Schupf Wing for the Works of Alex Katz at the Colby College Museum of Art, Maine, presents ongoing exhibitions of Katz’s paintings, cut-outs, drawings, and prints. It is one of the few museums in the United States devoted solely to the work of a single living artist. Museum collections worldwide include The Art Institute of Chicago; Hirshhorn Museum and Sculpture Garden at the Smithsonian Institution, Washington, D.C.; The Metropolitan Museum of Art, New York; Musée National d’Art Moderne Centre Georges Pompidou, Paris; Museo Nacional Centro de Arte Reina Sofia, Madrid; Museum of Fine Arts, Boston; The Museum of Modern Art, New York; National Gallery of Art, Washington, D.C.; National Museum of American Art, Smithsonian Institute, Washington, D.C.; Philadelphia Museum of Art; The Tate Gallery, London; and the Whitney Museum of American Art, New York. Recent exhibitions include the National Portrait Gallery, London, and the Philadelphia Museum of Art. He was inducted by the American Academy and Institute of Arts and Letters in 1988 and has received many honors and awards throughout is career. A fully illustrated color publication will be available for this exhibition. For further information, please contact Leo Xul xu@jamescohan.com or +86-21-54660825.